BRYAN S. LEMANSKI, is registered as a Patent Agent with the United States Patent and Trademark Office. Bryan is currently working on earning his Juris Doctor degree from Wayne State University Law School, expecting to graduate in May 2019. While in law school, Mr. Lemanski was involved with Wayne State’s Patent Procurement Clinic and Wayne Intellectual Property Student Association. 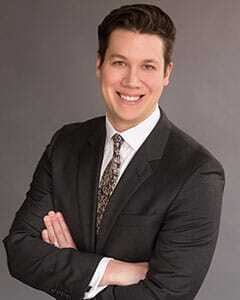 Prior to law school, Mr. Lemanski graduated from the University of Michigan – Ann Arbor in 2011 with a Bachelor of Science in Industrial and Operations Engineering. Before joining The Dobrusin Law Firm, Mr. Lemanski was an engineer in the automotive industry where he was involved with various stages in vehicle design, development, and manufacturing. In his engineering roles, Mr. Lemanski was responsible for product design and development, prototyping, testing, and manufacturing processes. As an engineer, Mr. Lemanski gained experience in passive and active safety systems, material stamping and molding, and electromechanical components.